If you didn’t know already, Salesforce is taking over the world. They offer an endlessly customizable platform, host an extravagant conference and they work with just about every imaginable industry. Naturally, we built an integration with them. If a Localist user gets substantial value from a product (such as Salesforce), our ability to work with that product will make our users' lives easier. That's a positive user experience. Now, some preface here. I do get a little inside baseball at times. In order to truly understand all the forces at play, it would be helpful to be a Localist user, a Salesforce user or both. That being said, let’s dive into an example of how this integration would work for a marketer who is both a user of Localist and Salesforce. Let’s imagine you work on the digital marketing team at a very large hospital. Your hospital just rolled out a state of the art treatment that will alleviate diabetic nerve pain with minimal invasiveness and a highly effective outcome. Exciting, right? This treatment procedure is relatively unproven but could be very profitable for the hospital. Furthermore, it has the potential to help a lot of people. You're tasked with getting some patients in the door to schedule consultations with clinicians regarding this new technology/treatment. Like every other marketer, you are tasked with filling the funnel. However, your boss has one guiding principle. You must be able to clearly prove marketing ROI. After evaluating some of your most effective channels, you decide an educational event will be the most effective marketing technique for this particular goal. Social ads and specialized landing pages are expensive. Furthermore, conversion rates will be low as people have been burned by failed treatments in the past. Lastly, it would be hard to determine actual ROI of the campaign as you would have to pull data from multiple sources. An event will allow for patients to engage with the clinicians, hospital staff, other diabetic nerve pain sufferers in their community. There are few channels that are better at building brand equity than events. Now that you have a general plan in place, let’s take a look at the heart of the campaign (the marketing funnel and data flow). These need to be laid out properly if you want to have any chance of proving marketing ROI. For both the marketing funnel and data flow, we will start with the image and then go over the rational. TOFU (Top of funnel): Marketing is all about filling the top of the funnel and maintaining conversion rates down the funnel. Ideally, people who make it all the way through the funnel come out as knowledgeable (about your product offering) contacts who will receive maximum value from the service your organization provides. The top of your funnel is filled by website visitors clicking through on any relevant messaging regarding the event. In our campaign, we utilize a variety of tools to fill the top of the funnel. Localist Widgets: Widgets are effectively mini event display ads that can live on any webpage (usually a homepage). They work with any content management system as they are just snippets of HTML code. They give basic info about the event and clicking on them leads the user to the Localist event landing page. The more widgets you can place on your website (or partner websites) the better, as this just creates more links pointing to your event landing page. Localist Newsletter: Our newsletter tool is similar to our widget builder, in terms of output. Our newsletter tool exports event content into mini ads. However, these can be sent in an email to a list, rather than living on a webpage. You can use the native Localist newsletter tool or any mass mailing tool. You would just export the event content email into another system. Localist Channels: You can set up a Localist channel for a specific group of events or a single event. A channel is effectively a customized web page that lives on your Localist platform. It has the event listing with information, but it can also contain some additional information that explains the context of the event. For example, you could include some statistics or testimonials to encourage conversion. Google AdWords: Lastly. Good ole AdWords. Google AdWords work very effectively if the targeting is set up properly and is considered as part of a larger marketing plan, rather than the backbone. In this campaign, we can target local folks who are searching for treatments for diabetic nerve pain. Our landing page can be the Localist event landing page. Localist event landing page: Every page in Localist is a unique URL that is SEO optimized and designed for user engagement. Furthermore, Localist is set up to natively integrate with Google analytics so you can track traffic within the platform. Once on the event landing page, the anonymous user is presented with a few factors that increase conversion (conversion being the user logging in or creating an account). A rich event description, an interactive map, and image give a full view of the event. The visitor doesn't have to go anywhere else to find the info they need. The call to action is a register button. From here users can register for the event and create a Localist account using a variety of social logins (Google, LinkedIn, Twitter, Facebook, etc). The goal of the even landing page is to increase motivation and reduce friction in the process of getting them registered for the event. 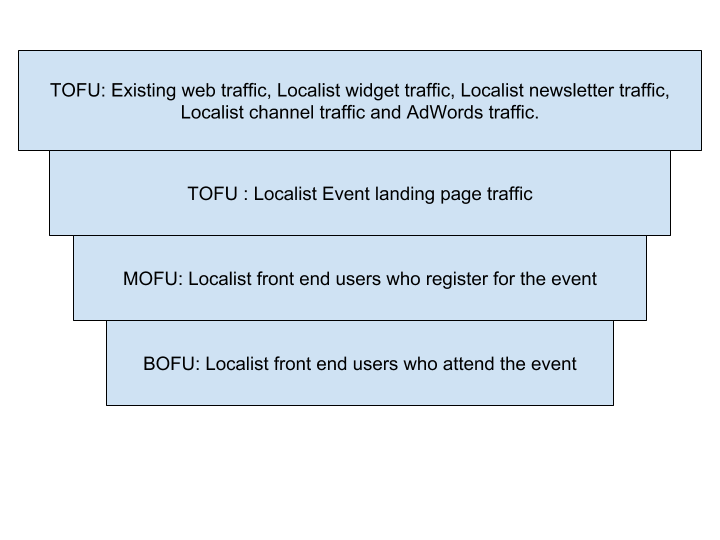 When a visitor creates a Localist account and registers for the event, you have turned anonymous traffic into an identified user they will move to the middle of the funnel. MOFU (Middle of the funnel): With many events, users will see a posting for the event, become interested but forget about it a few weeks later. This is normally because the event system listing the event is not actually interactive. It’s not ensuring that these people actually show up to the event. There is a few things you can do here as a marketer to ensure people show up to the event and receive value from your organization. Most of them are going to focus around email marketing. If you are using Localist and Salesforce, this is what the process will look like. As soon as these folks are registered for the event in Localist, they will automatically be created as contacts in Salesforce and assigned to a campaign that mirrors the name of the event. When contacts are in this campaign format, it allows for a lot more flexibility on the marketing front. Almost every email marketing automation system will work with salesforce campaigns. This means you can send them through an email cadence as soon as they register. A thank you email, an ‘invite your friends?’ email and most importantly an event reminder email. BOFU (Bottom of the funnel): This is the terminal point for a member of the marketing team. The goal is to get qualified folks to the event so the clinicians and folks putting on the event can convert them into paying patients. Work with the event team to have a clear call to action at the event. In our case, it's signing up for a consultation. Let’s talk about data flow and proving marketing ROI (never as easy as it sounds). For you to properly track data, you need to have systems that communicate with one another. Good news is if you use Localist and Salesforce the data will be consistent throughout the whole process. See the flowchart below. Web traffic: This is your target market as a whole. They are just not identified yet. You bring them in via ads, SEO, content marketing etc. For this particular campaign, you are focusing on using AdWords and targeting your existing web traffic with Localist Widgets, Newsletters and Channel Pages. You know these users have some type of interest in your organization (as they are on your site), but you are not sure if they are the right fit for your event, yet. Localist users: This is the first step in identification. Anonymous users need to login to Localist in order to register for the event. Good news, Localist designed it's interface around encouraging account creation/logging in. As soon as these users create an account or log in, their data is captured and actionable. Salesforce campaign contact: This is when the real ROI analysis starts to come into play. As soon as a contact is added in Localist, they are ported over as a Salesforce contact and associated with a campaign. The campaign name will mirror that of the Localist event and the campaign itself will be automatically created. This is minimal legwork for you, which is good. At this point, the contact is in the Salesforce campaign and they are now a part of this marketing campaign. At this point, their salesforce campaign status will be 'sent' meaning they are in the marketing campaign. Now let’s talk about why getting these contacts into a campaign matters. A campaign allows you to associate marketing activities with cold, hard revenue. Salesforce opportunity: Opportunities records are created when business is actually being done (money is being exchanged). Say a contact that flowed through the entire funnel signed up for a consultation a week later and then performed the treatment. You can ensure that the completion of sign-up process changes the Salesforce campaign status to 'responded'. That contact would be then associated with that opportunity and the revenue earned. This relationship allows for marketers to see which opportunities were influenced by which campaigns and which contacts 'responded'. This is hugely important for proving the ROI of marketing activities. At this point, your job is done. You have set some consultations up for your clinical team and you have an exact understanding of how much 'pipeline revenue' your campaign created. With Localist and Salesforce, you can track a user through the entire process from event discovery to payment. Since this structure is in place, it also allows you to optimize in areas with low conversion rates. Most importantly, you can grow your marketing budget as you can prove the efficacy of your event marketing efforts with solid, actionable data. Curious about using Salesforce with Localist? Let us know!